Items Sold By Amazon vs FBA vs FBM - Which is Better for Sellers? Items Sold By Amazon vs FBA vs FBM – Which is Better for Sellers to Profit From? Browsing through the Amazon site as a product seller requires a completely different mindset. You have to shift your mind from looking for things to buy and instead think about what YOU can sell. Why are these important? Because each 'shipping class' has strengths and weaknesses that we can leverage for profit! What Does Fulfilled by Merchant (FBM) Mean? At the start of Amazon, all of the products listed on the site had to be delivered by the seller themselves. Whether the seller owned the rights to the product or was a reseller, they had to figure out themselves how to get their product from the manufacturer to Amazon's warehouses. Many people still think that Amazon works the same as eBay. With sellers shipping products themselves. As an Amazon seller, there are a few ways for you to take advantage of FBM sellers and make money from. In particular, if they're doing well selling a particular product. Amazon is not favorable to sellers who cannot keep up with their sales. Running out of inventory is frowned upon and the responsibility of logistics can weaken a seller's ability to deliver hot products on time. Most FBM sellers do not have access to Amazon Prime customers. There are some FBM sellers who can add their listing to Prime customers, but only those with a proven track record. Although the number of Amazon prime customers isn't public, we know for sure that these members buy more frequently, spent more money yearly, and make up half of Amazon's customer base. One thing to note is that​ your fulfilment option does not have an affect on your ability to ungate a certain category. "The application process doesn't favor either delivery method - Amazon doesn't care about that aspect when it comes to category ungating", says Hunter Freeman of Freeman & Jentsch. How Do You Find FBM Sellers on Amazon? Currently, there is no quick way to filter Amazon's web page to find FBM sellers. You'll have to head over to every individual listing and see if the words "Ships from and sold by X" is found. The 'X' being the name of the seller. To combat this, we've created a column in our software that lists out whether a product is FBM (or FBA or Sold by Amazon.) The software interprets the data in the same way as you would by looking at the listing visually - but just does it faster. With this approach, we can easily tell which products are selling well and are shipped directly from the sellers and not through Amazon's own fulfillment service. In other words, it's low hanging fruit. What Does Fulfillment by Amazon (FBA) Mean? For sellers who have been on Amazon for a while, when the news of Amazon FBA came out - many people jumped on the opportunity. Instead of delivering items themselves, Amazon now handles that aspect for you and you gain access to their valuable Prime customers simultaneously. Using Amazon FBA to deliver goods is better for customer experience and in turn can help you get more seller and product reviews. It's our favorite way of delivering products and in many cases the only option for private labellers. The FBA service will eat into your profits because it is an added expense at the point of sale. Here is a breakdown of the fees for using FBA. Depending on the type of business model you have, your product may get mixed up and comingled with other brands in the Amazon warehouse. Amazon mixes together products that have the same SKU's so if you're wholesaling a product, it'll get mixed in with others that are doing the same. If you have your own product that you've created, you're the only one that sells it, own's the buy box and therefore your product isn't comingled with others. 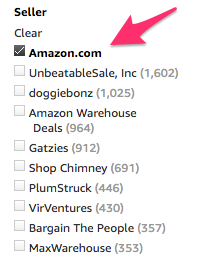 There is no filtering option that exists on Amazon's site to allows you to only filter FBA sellers. For good reason as well, customers just aren't looking for that option. Which makes sense and this is the exact reason why we said that you have to put yourself into the mind of a seller. Looking through the lens differently. As we mentioned before, the only way we've been able to create useful data is by creating it ourselves. What does 'Items Sold by Amazon' Mean? These are the items that Amazon purchases themselves either as a wholesaler or as a private labeller. Back in the early days of Amazon selling, people were advised not to go after products that Amazon sells themselves. This simply isn't true. Amazon customers aren't attached to choosing their brand over any other unless of course, the product is outstanding. We haven't seen any cases where Amazon favors it's own products more than competitors. So don't be afraid to take a deeper dive into a product that Amazon sells, although generally, you won't find much margin. The products are usually very low priced and if they're anything like Wal-Mart, they're squeezing as much out of manufacturers as possible because they can. Which can mean a decrease in quality. How To Find Items Sold By Amazon? This is fairly simple on Amazons web page, simply go to the left-hand side bar and select 'Amazon.com' as the seller. 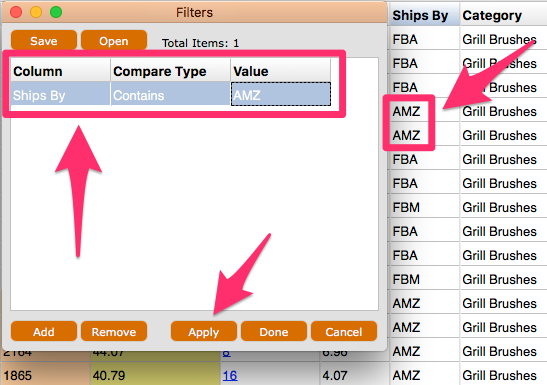 Also, if you're using Amasuite you can filter the 'ships by' column to only show 'AMZ' - which means Ships and Sold By Amazon for short. Which Type of Seller Offers the Highest Opportunity? None specifically. Targeting a type of delivery method on Amazon isn't going to give you the highest chance of success. There is no set rule for whether FBM products offer the best opportunity or that products sold by Amazon are all crappy and should be improved upon. The next logical step is to take a look at our guide for finding private label products, we break down what's necessary to find a hot selling item with poor reviews and decide which modifications to improve upon. 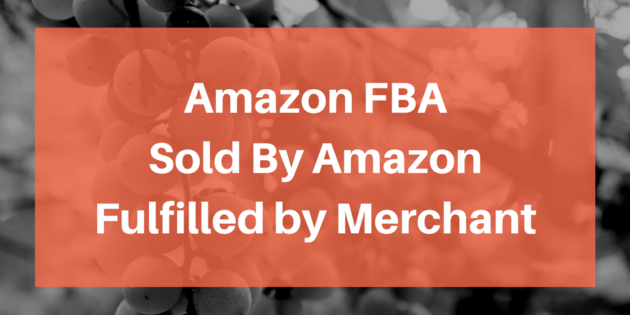 We don't usually filter by FBA, FBM or AMZ because we'd rather look at Amazon as a whole. It doesn't matter as much whether a product is sold by Amazon or not, if an opportunity lies in there - we'll take it.